Make Music Chicago, the completely free, one-day music festival presented by Rush Hour Concerts, announces a schedule of highlighted events for the second annual music celebration on the first day of summer, Thursday, June 21. Currently over 800 musicians are signed up to perform throughout the day at 75 different sites. Make Music Chicago is free to both audiences and musicians alike and no tickets are required for any of the events. 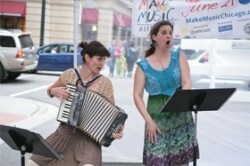 A complete and up-to-the-minute list of music-makers and performance sites can be found at www.makemusichicago.org.